Blind bought this and have been VERY happy with it. No regrets whatsoever <3 Must have for Drums and Guitar! This is yet another example of why I love Universal Audio so much. I've been working with the Chandler Curve Bender for awhile now, and I can say that using this to finish off a master is just GOLD every time. A real secret weapon for my drums !!! Simple: request the Demo version, use it and after 10 minutes you will surely have bought it !!! I love when I drop money and don’t regret it one bit. This compressor is terrific for just about anything but I had it on a guitar buss and I dialed in a setting that allowed the guitars to breakthrough a busy mix but still allow the other instruments to exist. What a gem! 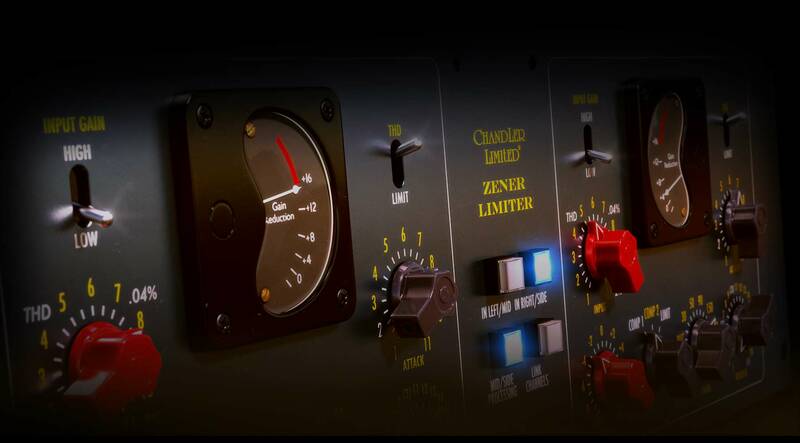 Chandler Limited Zener Limiter very useful as limiter!!! I really love this plugin!! Especially I like to plug this into the Master Bus in "THD" mode. Very Puncy and powerful Sound~! Klinkt erg goed, goed inzetbaar. Erg blij mee. My Brother has the real unit and we A/B'd them. The processing is amazingly similar. The hardware still has the edge but the plugin is worth it's weight in gold. This is my favourite drum buss Limiter. Using it for parallel limiting, mixing it with the unlimited signal is killer. It adds punch and depth to the drum sound and really helps the track rock! Top Job guys. Killer on parallel drum bus!! Amazing with my drum bus setup. I definitely recommend this to any serious mixing/mastering engineer or producer. My favorite vintage color box! I love this on drums and vocals that need to get that little extra punch and/or gritt. THD mode on parallel tracks. It's a versatile creative monster. In combination with the Curve Bender it's awesome to get that vintage character. I know this is meant to be more of a mastering tool. But it is by far my favourite drum compressor. I can`t really explain why this is audibly better than nearly every other drum bus compressor but I prefer it with acoustic drums as well as drum machine tracks. This simulated unit from the past is magic for bringing EDM beats to life, make them fatter, add a little dirt and scratches and make them a great foundation for whatever is layered on top of it. Close to the original abbey road design...Does work well on many mix concepts especially drum parallel compression. Will add color to your buss mix as well. Good presets to play around with, not much tweaking needed. Do demo it on individual tracks and especially drums and see if you get the color you need.